Our ancestors, keen to try to keep the lines pure, did start a bit of a thing about our blue eyes. They would say that green eyes were the evil eyes of jealousy, now why would they say that? Green eyes happen when the genes of those with blue eyes are mixed with the genes of those with brown eyes, so someone with green eyes carries genes for both brown and blue eyes, and seeing as Cro-Magnons are a mix of Homo Heidelbergensis who had brown eyes, and Neanderthals with blue eyes, many of them did have green eyes. So Cro-Magnon's predominately had green eyes, and were the ones who tried to kill us all because of their envy. The hand of Mary, including the eye of Mary, the Divine Mother of the Grail bloodline. Not only do these earrings look adorable, they also protect the wearer from the Evil Eye. Stunning earrings. The protective hand and eye of Miriam. 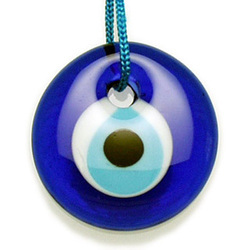 Protection Spell Evil Eye Candles come with a Hamsa Evil Eye Protection Charm Talisman.